Nobody wants to show up for a Halloween party and be asked, "so who are YOU supposed to be?!" 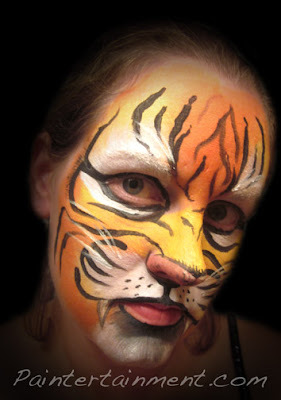 Choosing a Halloween persona that incorporates face painting is a great way to achieve the full effect and really look like who you're trying to look like! Lady Gaga - Pretty much anything goes, but the above looks can be achieved with Aquacolor paints in the color of your choosing using brushes, paired up with some glitter, glitter spray, or go all out with some acrylic rhinestones attached with eyelash adhesive or spirit gum! Captain Jack Sparrow - Use a brush with some Aquacolor white, black, and green to paint his extra eyes! The Joker - Try wrinkling up your face while blotting on some Aquacolor white paint with a sponge. 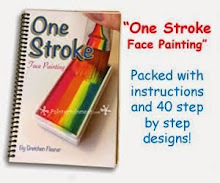 This will help achieve those "cracks" of no paint where the wrinkles are. 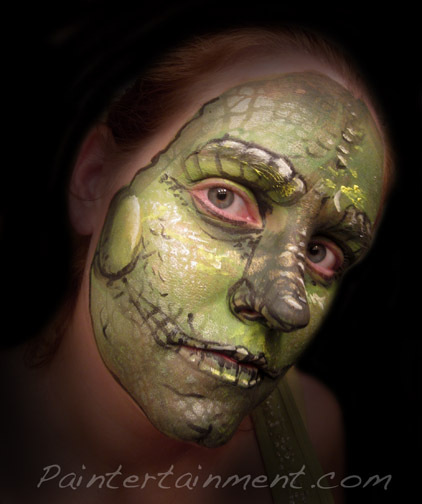 Then get some red for the mouth and apply with a brush, and do a mix of black and green around the eyes. Put a little extra water in the black and red to allow it to bleed into the cracks and you've got yourself one creepy looking Joker face! 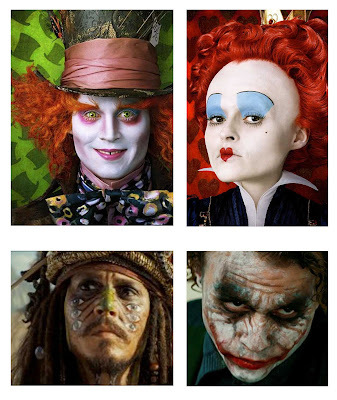 KISS - Try some clown white or aquacolor white for a base applied with a round or wedge sponge. Then add the black details with a brush and black Aquacolor paint. 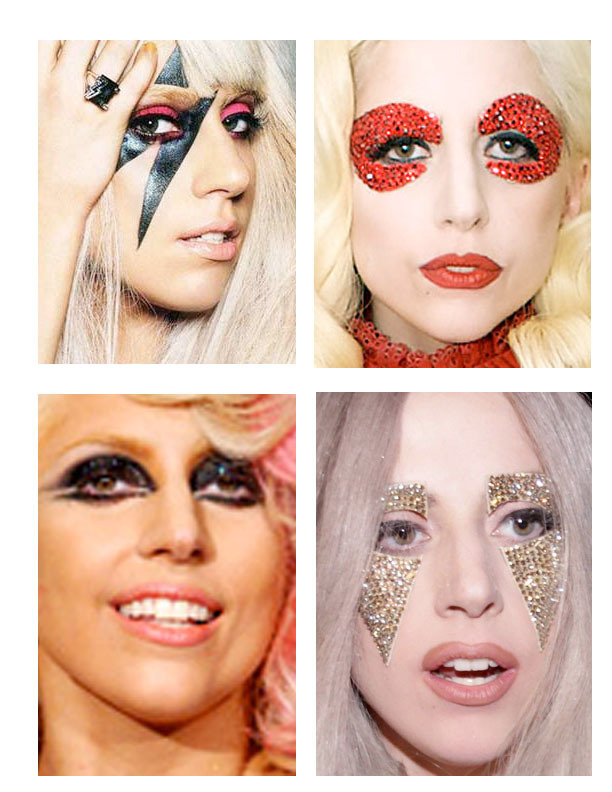 Use metallic silver around the eyes if that's the face you choose! Be sure to sign up for our FREE e-newsletter too if you haven't already...the next one will be coming out in just days and will include a cute step-by-step Halloween bat cheek art design, as well as some really cool "sugar skull" designs! Got something awesome planned for this Halloween involving face paint? We'd love to see how it turns out and post your photos! Contact me if you'd like to share your costume ideas, past or present! 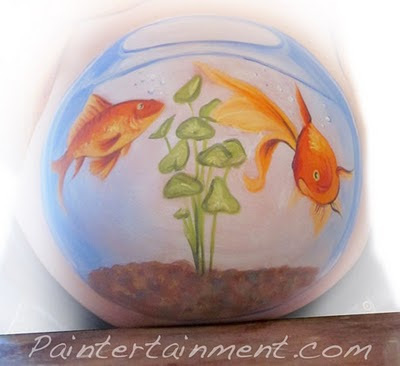 Baby Bump Painting: Goldfish Bowl! 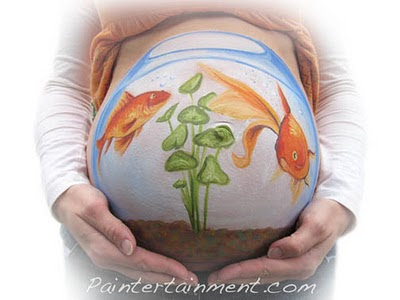 Pregnant belly painting, also known as "gestational art," is all the rage these days. 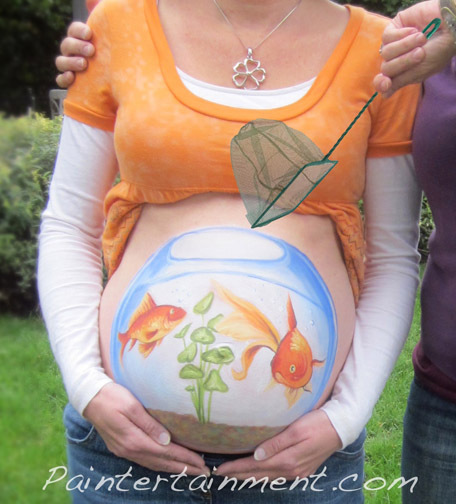 Moms-to-be are having their bellies painted and photographed with their dads-to-be for their baby books, and even having them done at baby showers! You may have seen moms on A Baby Story having their bellies painted, or maybe you've seen some celebrities in the news having it done, like Mariah Carey. 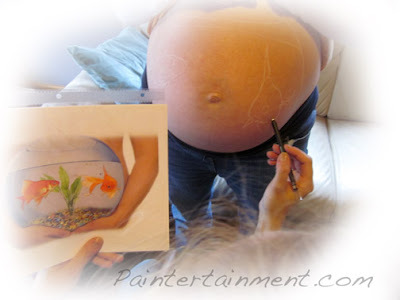 Having your baby bump painted and photographed is a really fun way to preserve some memories from pregnancy and celebrate your growing belly! 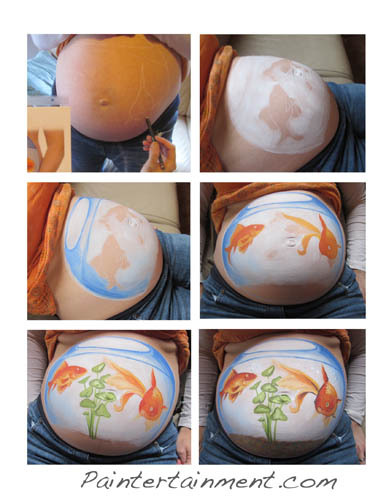 I've always had so much fun studying all of the photos of baby bump art in my face & body painting magazines, so I put a feeler out on Facebook to see if I could get a model or two to let me paint them. 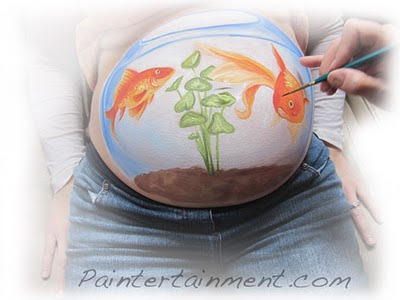 My wonderful second cousin, who is 32 weeks pregnant, graciously volunteered, having never even heard of having your belly painted! ...and here's the finished piece...pretty close! I gave her a page of different plants to choose from, and she picked these cute lilly pads which were fun shapes to create! After reading some suggestions from experienced belly painters on the face paint forum, I decided to have her stand at first while I drew the basic design on her belly with a makeup pencil ($5 each for black or white). This prevents the design from looking distorted when she is done and stands back up. Above are a few progess shots along the way. I used a round makeup sponge that I had cut in half ($1.20 each) to fill in the white base and some blue shading. Then I used my #28 flat sable brush ($19.50) to feather and blend the blue and white to give the bowl a nice round appearance. From there I used my #5 and #2 contour round brushes ($3.40 & $4.60) to fill in all of the colors and details. I'm really glad that she brought her mom to share in the experience, because she was a great photographer and captured the whole process! I've never really painted pictures of goldfish and it was really fun. Normally I spend about 30 seconds to a minute on a design, on very adorable yet wiggly children. 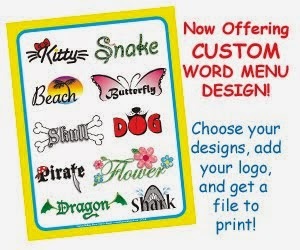 I was wondering if I could even get myself to spend more than 20 minutes on a design! Turns out the challenge for me was making myself STOP tweaking and adding more detail after over an hour of painting! The time flew by though and I already can't wait for my next belly painting. ...although I was kindof wishing I had a cat to put next to her! 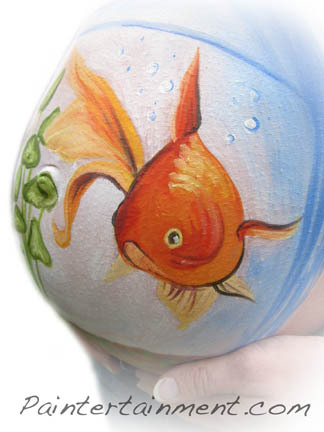 If you live in the Twin Cities area (Minneapolis / St Paul Minnesota) and are interested in having your belly painted, or in giving a belly painting as a gift to an expectant mom, check out my website here for more info! New Package Deal: The Charity Fundraising Kit! 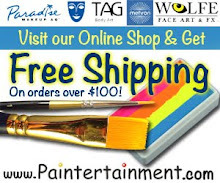 I am pleased to announce yet another new product introduction to the Paintertainment online shop...the Charity Fundraiser Kit! 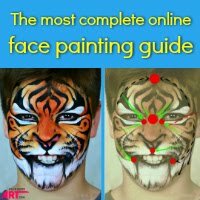 This kit was designed to help people raise money for various charitable causes, enabling someone with no experience face painting to achieve professional results without the high price tag of hiring an actual professional. 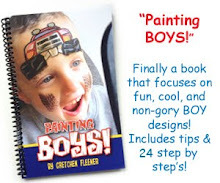 Click here for a video demonstration! Not sure what colors represent what causes? I'm in the process of putting together my own color chart, but in the meantime, I really like this one put together by Fire Mountain Gems, a place I like to buy beads for jewelry making! Tonight I finally had a chance to try out a few of the fun new products that were recently added to Paintertainment's online shop! I took photos along the way so that I could share a little rainbow butterfly how-to for you! 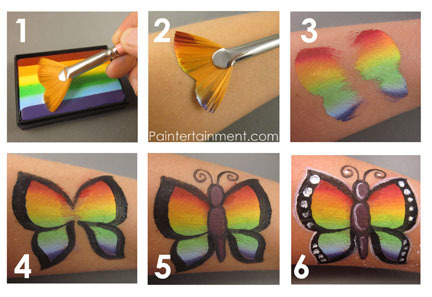 2) Lay the butterfly fan brush against the skin, making sure that all colors make contact. 3) Swipe to the right as you lift the brush up for the left wing! Repeat using the other side of the brush for the right wing. 4) Outline the wings in black. 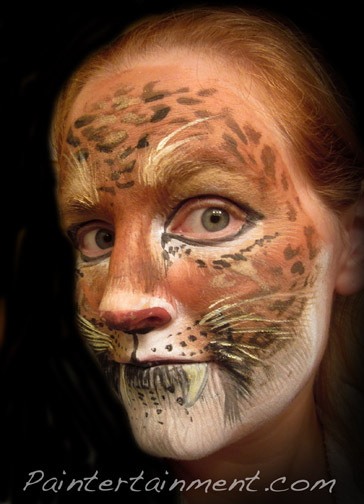 I used the Kryolan #5 round brush and black Aquacolor paint. 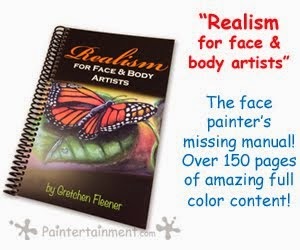 5) Paint a body and add antennae and outlines. I used more of the Kryolan Aquacolor paint for the body, and a black bottle of Paradise Detailz for the outlines and antennae. 6) Add the finishing touches in white! I used the Snazaroo dotting wand for the white dots on the edges of the wings, and a white bottle of Paradise Detailz for the fine highlights and details. 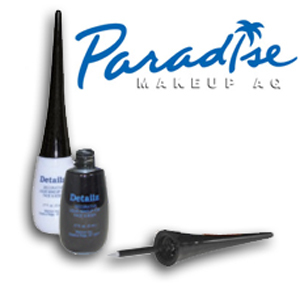 New Paradise & Mehron Products Now Available! 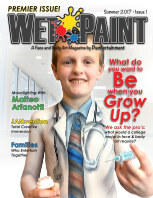 I'm pleased to announce another round of great new products just added to Paintertainment.com! - Glitter spray is a water based gel with glitter suspended throughout. It may be sprayed on the skin, hair or clothing. Use alone or to add sparkling accents! 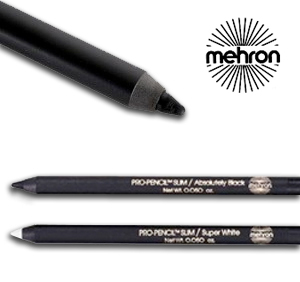 - These silky smooth, ultra creamy pencils glide on with ease and come with a sturdy composite casing to protect the tip. Use them to draw designs or outline shapes to indicate placement of makeup...a must have for clowns and baby bump artists! Hint: for better point, put pencil in the freezer for a few minutes before sharpening! 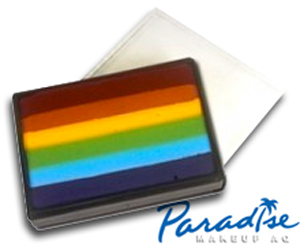 - This 6-color rainbow cake is made up of Mehron's world famous Paradise Makeup AQ paint. The large surface of the rectangular cake has equal amounts of each color. 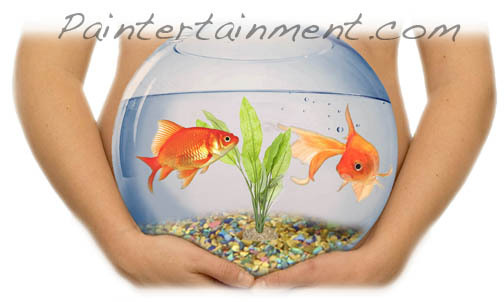 They can be applied with a dampened sponge or brush, and remove easily with soap and water. The container measures about 3 1/8" x 2 1/4"
-This liquid color concentrate is specifically designed for detail work. Each bottle comes with its own special applicator that provides the artist with the ability to add those fine details to intricate designs, outlines, fine lines, round accent spots and dots of various sizes. I can't WAIT to try out all of these cool products, and as soon as I do I'll be sure to post pictures! Full Faces Freak me out! Leopard - This was my first try at using a "rake brush," and a neat animal print stencil I just bought online. Never thought I'd use a stencil but they are pretty slick for things like prints! Trying out another new stencil of reptile skin! The interferenz paints were pretty cool for this. If I did it again I'd do a darker base and then do the stencil'ed pattern in lighter green. I used to have an iguana named Gonzo. 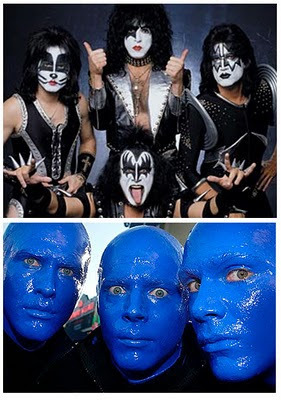 There's your trivia for the day.